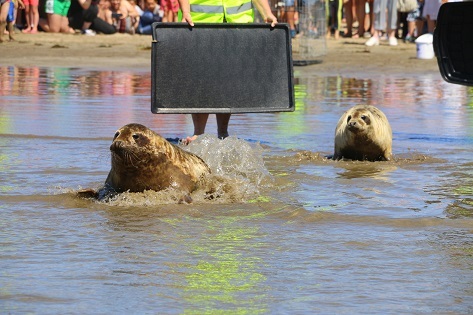 Leitrim beach goers were surprised to witness a beautiful scene on Rossnowlagh Beach, Co Donegal on Sunday afternoon (July 8) as seal pups Merlin and Danby were released back into the wild after six months in recuperation at the Seal Sanctuary in Courtown in County Wexford. 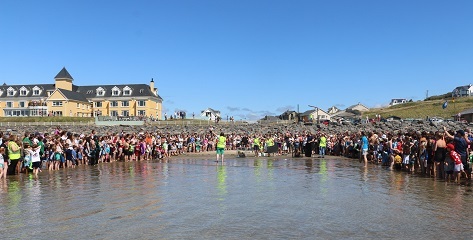 As the seals were brought carefully to the packed beach hundreds gathered to watch this miracle of nature. Both seals had been washed up in an emaciated condition on beaches in different parts of the country in Rossnowlagh and Waterford and have spent the last six months in a pool together at the sanctuary. From their behaviour it would seem that they have struck up quite a healthy relationship and expressed a reluctance to leave our Donegal Shores. At the time of their release the beach was packed with surfers and swimmers but local surf school owner James Garvey marshalled the troops to clear a safe passage for Merlin and Danby.